Magnetite in large lumps is crushed into small particles by magnetite ore crushers. Common coarse magnetite ore crushers are jaw crusher (primary crusher) and cone crusher or fine jaw crusher (secondary crusher). Vibrating screen is used to separate large particles from small ones. If the product is still too large, you can add a ball mill for magnetite particle milling. The sized magnetite ore particles are separated by the magnetite separator from the gangue minerals with a magnet. 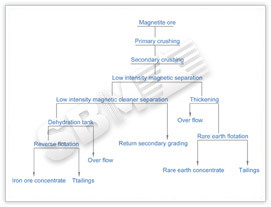 Low content magnetite particles are moved to thickener and then rare earth flotation machine. The obtained products are rare earth concentrate and tailings. High content magnetite materials are moved to dehydration tank, and then to reverse flotation machine in order to upgrade iron ore particles. The high content product of obtained materials is iron ore concentrate, and the rest one is flotation tailings. This magnetite beneficiation process is usually so efficient that lower grade ore can be treated when it is magnetite than a comparable grade of hematite ore, especially when the magnetite is quite coarse.